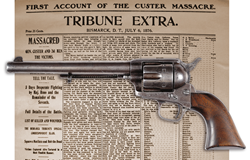 James D. Julia Auctioneers will be selling a Colt SA Army in original condition, positively proven to have been used by Custer’s men at the infamous Battle of the Little Bighorn. Lot #1129, a Colt Single Action Army Sn 5773 Positively Proven to Have Been Used by One of Custer’s Men During the Infamous Battle of The Little Bighorn, estimated at $175,000-275,000. "Because of its positive identification, and alteration-free status, this is the only complete and original Colt SAA positively used at the Battle of the Little Bighorn." On Tuesday, April 11th, 2017, James D. Julia Auctioneers will be auctioning a great American treasure. This is lot #1129, a Colt SA Army in original condition, positively proven to have been used by Custer’s men at the infamous Battle of the Little Bighorn. The Battle of the Little Bighorn, or Custer’s Last Stand, is unquestionably the most infamous battle between the U.S. Cavalry and the American Indians during the Indian War period. General George Armstrong Custer, together with approximately 800 troopers, were part of the large contingent of cavalry sent into the field to find Chief Sitting Bull and his followers and to bring them back to the reservation. Custer had distinguished himself in the Civil War by being a highly aggressive and successful commander in battle, and when he went into the field in June of 1876, he was determined to be the one to capture Sitting Bull. On the 25th of June, his scouts discovered a large Indian village on the banks of the Little Big Horn. He assumed that the village comprised of Sitting Bull and his followers, which would probably include a matter of a few hundred braves. But unbeknownst to Custer, rather than a few hundred, there were literally thousands, made up of Northern Cheyenne, Lakota Sioux, and Arapaho Indians. Not knowing this, Custer divided his troops into 3 units and intended to attack the village in a pincer-type action with the goal to repress the Indians and to put them immediately under his control. One of the units led by Major Reno attacked the north end of the village, while Custer circled around to the southern end of the village. Reno’s command was immediately confronted by a much superior force and he barely escaped across the river to a defensive position at the top of the hill. Custer, however, was not so fortunate. While attempting to ford the river to attack the village, he was immediately set upon by a far, far superior number of warriors. In the subsequent retreat, Custer’s command disintegrated. The Indians eventually annihilated every single man in Custer’s unit. It was a complete massacre. After the battle, as standard protocol, the Indians removed everything from the troopers and the battlefield that represented any value to the Indians. This included boots, uniforms, and most particularly, guns. Two days later, when Captain Benteen, together with a command, arrived at the scene to bury their comrades, they discovered a grisly site. Their brothers in arms’ naked, bloated, and mutilated bodies were scattered over the battlefield. Benteen and his men gathered and buried all the bodies. Some months after the massacre, in December of 1876, Captain Benteen appeared at Fort Rice, Dakota Territory. There he presented the Military Board a group of firearms, including some carbines and 3 Colt SA firearms (this one being one of them). The guns were all “…rendered unserviceable in action against the hostile Indians at the Battle of the Little Bighorn, N.T. on the 25th & 26th of June, 1876”, in the Captain’s own words. Everything was returned to the armory and it is known that 2 of the 3 Colts were stored in there until the outbreak of the Spanish-American War. Then, because of the desperate, immediate need for firearms, these guns were reconfigured, fitted with shorter barrels, refinished, upgraded, and dispersed to the troops fighting the Spanish-American War. This gun, SN #5773, was never altered and never distributed. How it landed in private hands is unknown. In any case, because of its positive identification, and alteration-free status, it is the only complete and original Colt SAA positively used at the Battle of the Little Bighorn. In 1980, after a special archaeological dig at the battle site, excavated cartridge cases used during the battle underwent special forensic testing. This was done in an attempt to match up various guns currently held in museums and private hands to a casing from the battle site. Only a few guns in museums tested positive with five or six of them being in private hands. Since that time, a few others have been forensically matched. Because forensic science is not perfect, the results - in some cases - can be inconclusive. The only complete and original Colt SAA in private hands today, positively identified as having been at this historic fight, is SN #5773. Because the Indians had carefully swept the battlefield clear of nearly all guns and carried them away, today there are almost no guns in private hands that are positively proven to have been at this battle site - with the gun up for sale at Julia’s being one of the very few exceptions. There are, of course, a number of guns that come with claims that they were captured or used at the Battle of the Little Bighorn, based on family lore or legend. But none of those firearms can be absolutely proven to have been used there. This gun is a truly rare and historic object related to one of the most historic and disastrous U.S. Military engagements of all times up to June, 1876. This rare gun comes to auction with a presale estimate of $175,000-275,000 and some members of the collecting fraternity consider these numbers to be very conservative and reasonable. Rare arms and objects related to the Battle of the Little Bighorn are not unfamiliar to James D. Julia. In April of 2000, Julia’s handled a Winchester Model 66 rifle forensically proven to have been at the battle and used by a Cheyenne brave. Although the 66 Carbine in its condition would normally bring at that time $3,000 or $4,000, this gun - because of its extraordinary historic import - saw tremendous competition and finally sold for $684,500. This rare gun is part of an extraordinary offering of rare firearms, including important Confederate Arms, noted outlaw Cole Younger’s Smith & Wesson revolver, Bowie knives, swords, historic Winchesters, rare military arms and headgear, and a spectacular diversity of superb high quality sporting arms, to be sold at the company’s April 11th-13th Fine Firearms auction in Fairfield, Maine. The sale starts at 10am each day. All items will be available for preview on April 8th-10th from 9am to 5pm daily. For more information, please see http://www.jamesdjulia.com. James D. Julia, Inc. is one of the top ten antique auction houses in North America as measured by annual sales and is the leading auction house in the world for high end, rare, and valuable firearms. The company conducts two extraordinary firearms auctions a year in Fairfield, Maine where clients from all over the world gather to compete on rare treasures such as this important Colt SAA. In business for over 45 years, the company routinely establishes new world records. Julia’s consists of three key divisions, including rare firearms and militaria; fine and Asian art and antiques; and lamps, glass, and jewelry. Each division is regarded for its excellence and is staffed with world-class specialists to insure fair and professional authentication, identification, and valuation services. For more information on James D. Julia, Inc., please visit http://www.jamesdjulia.com. Julia's is one of the top ten antique auction houses in North America as measured by annual sales and is the leading auction house in the world for high end, rare, and valuable firearms.